Is it about being famous? Or is it about doing good work and becoming famous as a result? As a senior editor at National Geographic for 37 years, Mary Smith worked with prominent research grantees—including primatologist Dian Fossey, paleoanthropologists Louis and Mary Leakey, and conservationist George Schaller—to produce illustrated articles for the magazine based on their work. Is it true that Leakey—who started Jane on her life’s work with chimpanzees—tried to get you [Mary] to work for him too? “Mary, I can make you famous,” he told me. He wanted me to give up my career at the magazine to go study aardvarks. Given Mary’s role now at National Geographic, she’s become famous in her own right. Did she need Louis Leakey? NO. She may have though, had she wanted to study Aardvarks. As Jane Goodall described at her 80th birthday celebrations, regardless of whether the likes of Leakey stepped up, she was going to Africa and she was going to spend time with/study gorillas. If it had not been Leakey, she just would have found another way. It had nothing to do with fame and everything to do with spending time with the creatures she so admired and to get to know them better. How about your own journey to date? Are you in it for the fame/money or for the greater good? 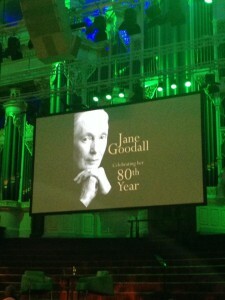 I would also personally describe Jane Goodall (and maybe Mary Smith?) as one hell of an entrepreneurial mother!